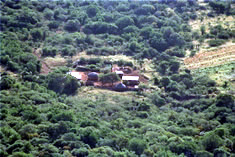 Zisize is located in Ingwavuma, a remote rural area of KwaZuluNatal in South Africa. 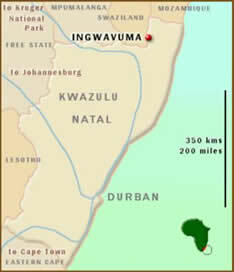 Ingwavuma is more than 250km away from the nearest industrial centre, Richards Bay, and 420km from Durban. 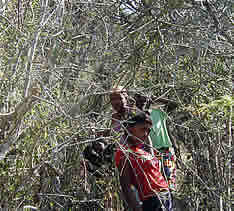 Rarely is it to be found on maps of the area and many people in the province have never heard of it. 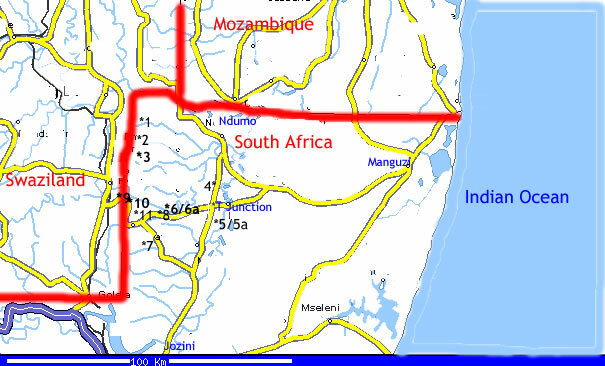 It is situated to the west and north of the compass sign (map below right) and stretches the length of the border with Swaziland and up to the border with Mozambique. 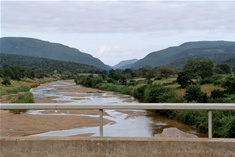 Zisize's projects are in several locations in three of Ingwavuma's four tribal areas, and up to 60km from the centre of Ingwavuma, mostly along rough dirt roads. 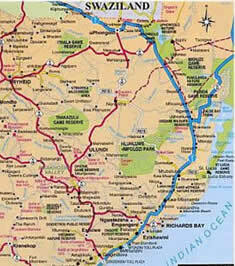 Below is a rough map of their locations, labelled in black. 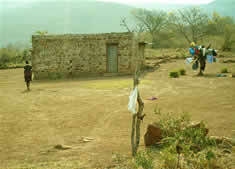 1 = Ekuhlehleni; 2 = Manyiseni; 3 = Mayaluka; 4 = Mgedula; 5 = Okhayeni; 5a = Ohhoye; 6 = Entabayengwe; 6a = Nqobizazi; 7 = Mpontshini; 8 = Zisize KwaQatha Centre; 9 = Mbalekelwa; 10 = Our Lady; 11 = Ingwavuma High. 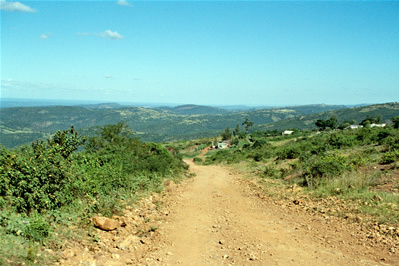 Although there is now a tar road linking the centre of Ingwavuma to the main road from Jozini to Kosi Bay, all other roads are rough dirt tracks, many only passable by 4x4 or by foot. The picture below shows one of the better ones. Most people live without electricity, using candles for light and bottled gas or wood for cooking. 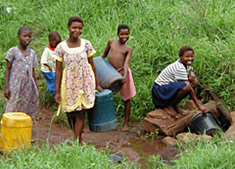 Water is collected from springs, bore holes, rivers and, where these are in place, from communal metered standpipes. 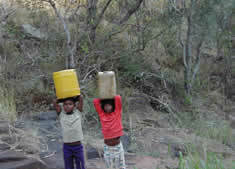 Water collection is mainly the responsibility of children. These containers are 20 or 25 litres. 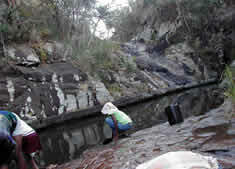 Adult unemployment stands at 60% and 85% of those in employment earn less than R1500 per month, so poverty is widespread. 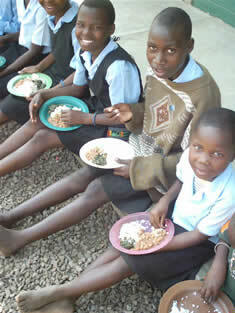 Illiteracy rates are high, as is the incidence of HIV and AIDS. In 2007 39.8% of pregnant women atending the local hospital were HIV+. 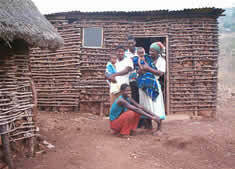 More than half of all deaths in Ingwavuma between 2003 and 2008 were certified to be the result of HIV/AIDS. The average life expectancy has improved since the roll out of ARVs and now stands at 48 years. (The Southern African Journal of HIV Medicine April 2010). 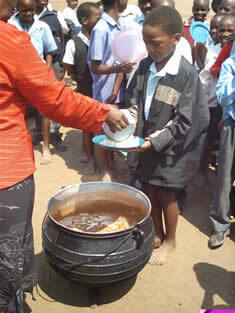 Children in many communities come to school hungry and for many their only meal is the one they receive at school. 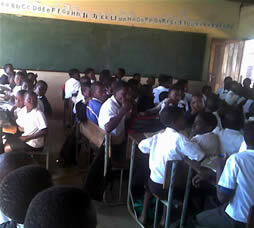 Children are taught in large classes (80 is not uncommon) and many are grossly overcrowded. 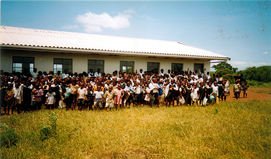 All the children below right squash into two classrooms.